When she was born we got four copies of Blueberries for Sal. Our Sal—Sally Hay, she will tell you if you ask her name—has lived up to her namesake. She looks just like those blue-ink drawings of the sweet toothy girl with the wild hair—and "booberries" are her favorite food. 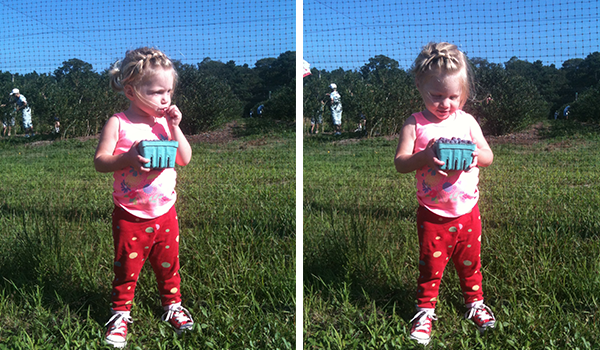 I took her picking in Dennis last week—the last picking of the season. We didn't get much—they were limiting it to a single pint per person—but she loved it all the same. She ran up and down the rows picking and snacking from the lower branches while I filled up our boxes, and she ate her entire pint on the car ride home. The woman who runs the place said the time to come is in early July. She said she and her husband never have to spray against fruit flies until later in the season (they had to spray twice this year) and so the berries are all pesticide free early on. There are also more of them, which means you can pick enough to fill your freezer or make jam or a pie.